Monopoly - Games - SMS Power! 69 CVG magazine "Complete Guide to Sega"
Mono Poly is a cart label variation/error not a publicized title. "Pass GO and collect $200!" "Go directly to Jail!". 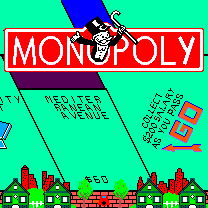 Everyone knows MONOPOLY, the world famous real estate trading game. 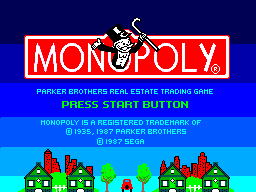 Now, you can play the exciting MONOPOLY video game on your Sega System! 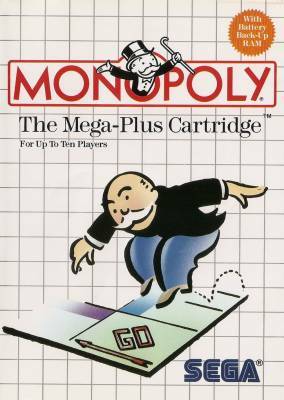 MONOPOLY is fantastic fun for the entire family. You can play against the computer — with skill levels you select — or get up to ten players in on the action. It has special features such as a built-in battery so you can save games and play them later. Roll the dice with a push of a button. Your token comes to life and moves around the board! Buy companies and properties. Increase the value of your properties by building houses and hotels. land on "Chance" or "Community Chest" and pick a card. With strategy and luck, you can become a winner. But you never know how the dice will roll! Cart label spelling error. With "Sega for the 90's The New Generation" sticker.